Kurt Cobain of Nirvana performs in a 1993 file photo in New York City (L). Courtney Love attends an event on Jan. 05, 2019 in Los Angeles (R). 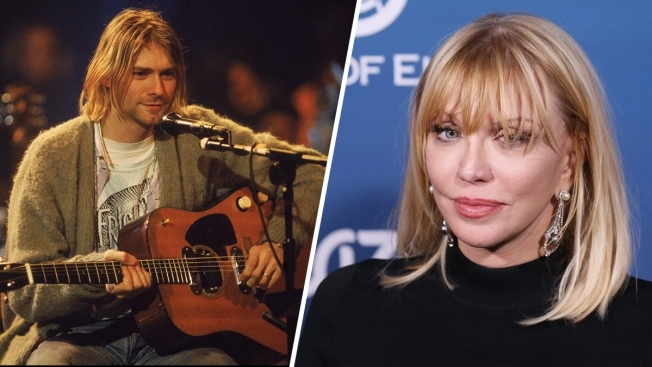 A judge has cleared the way for a lawsuit against Courtney Love and others by her former son-in-law -- which stems from an alleged attack on the plaintiff in 2016 to try and obtain a prized guitar that once belonged to her late husband Kurt Cobain -- to move forward. Los Angeles Superior Court Judge Randolph Hammock finalized a tentative ruling he issued Jan. 30, striking only plaintiff Isaiah Silva's intentional infliction of emotional distress claim insofar as it dealt with derogatory comments the defendants allegedly made about him via social media. He agreed with defense attorneys that it was protected speech. However, Hammock said he believed the other allegations the defense sought to strike -- negligence, false imprisonment/kidnapping, extortion and stalking -- should remain. He said he saw no evidence that any of those claims were related to the defendants' First Amendment rights. Silva alleges Nazarian worked for Love and that the investigator and others went to the plaintiff's home on a date subsequent to the alleged attack. He maintains Nazarian was aggressive toward him and his mother. The complaint filed last May 25 alleges that Love, celebrity manager Osama "Sam'' Lutfi and actor Ross Butler conspired to kidnap and try to kill her former son-in-law to try and reclaim a guitar once owned by the singer/actress' late husband. The 1959 Martin D-18E guitar was used during Nirvana's iconic "MTV Unplugged in New York'' performance in 1993. Cobain committed suicide the next year. Since Love's daughter, Frances Bean Cobain, filed for divorce from Silva in 2016, the guitar has been the subject of public interest and a contested issue in their marital split. A family law judge awarded the instrument to Silva. The complaint alleges that in June 2016, Lutfi, Butler and another man, Yan Yukhtman, broke into Silva's West Hollywood home and banged on his bedroom door, saying that they were members of the Los Angeles Police Department. Silva claims he was later dragged out of his home and taken away in a black Cadillac Escalade. Silva's attorney, Douglas Unger, alleges that Love told Lutfi and others to use threats in order to convince Silva to agree to a settlement agreement to return the guitar and concur with her other demands. Unger further alleges Love was the mastermind of the actions against his client and that attorney Marc Gans told Lutfi not to let Silva leave the home until the settlement paperwork was completed.